Despite its small size, there are a lot of top tourist attractions in St. Andrews, Scotland. Located in the Fife Peninsula, this small, Scottish town has enjoyed a healthy influx of visitors. Many have come here to pay homage to the birthplace of golf. Why not? The Royal and Ancient Golf Club was founded in this little town 1754 in the Fife Peninsula southeast of Dundee. And, since 1897, members of this established club has been recognized internationally as the ruling body of golf. St Andrews is very easy to get to, Edinburgh, which has many international and national connects is only 50 miles away, check Tripscan.com for good deals on flights there. But there’s more to this town than being the home of golf. Here are some of the top tourist attractions in St. Andrews not to miss! St. Andrews has a pivotal role in Scottish ecclesiastical history. The churches and religious monuments that dot St. Andrews’ landscape is testimony to this. According to legend, St. Regulus arrived in this town with the remains of St. Andrews. And since then, it has become a site of pilgrimage. In 1200, several churches were put up in town, including the St. Andrews Cathedral. By the 15th century, the St. Andrews Cathedral has now become the biggest cathedral in Scotland and the seat of the archbishop. James V and Mary of Guise were wed here, forming the Franco-Scottish alliance. However, in 1559, the cathedral was destroyed. Today, only parts of the Romanesque cathedral are left. This castle was built at the same time as St. Andrews Cathedral in 1200. It served as the Bishop’s residence for centuries. 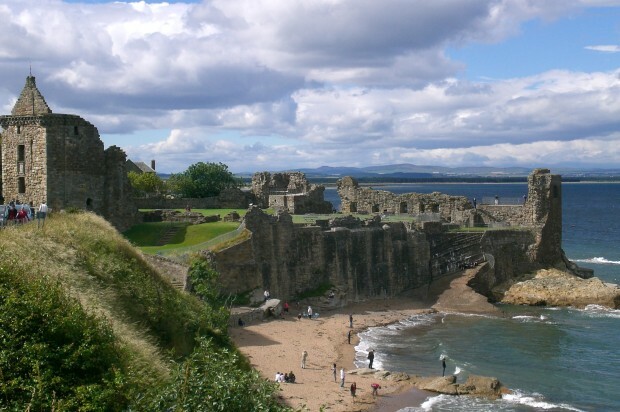 The St. Andrews Castle was then destroyed during the Reformation, leaving nothing but the ruins which we see today. But luckily, a modern visitor centre has provided details of the castle’s history. The Sea Life Centre gives you a fascinating insight on marine life, with its various attractions which include an aquarium, a shark pool and a marine laboratory. It also has a wonderful beach café where you can make a quick pit stop to rest your feet and grab a bite while marvelling at the beach’s horizon. It would be an insult if we did not as much as mention St. Andrews’ golf heritage in the top tourist attractions in St. Andrews. First stop is the Old Golf Course. This golf course runs along the coast of St. Andrews and originally had 22 holes. It was reduced to 18 holes in 1836. The headquarters of the Royal and Ancient Golf Club is also found here. Next stop is the British Golf Museum, where you can find an extensive exhibit of golf artefacts, and everything that has to do anything with golf. These are just some of the top tourist attractions in St Andrews, but there are plenty more. Make a weekend out of it and enjoy one of Scotland’s gems. Bon Voyage! All content © 2015 by Europe Travel Catalog.